The Integral PATA DOM (PATA Flash Module) can be inserted directly onto the motherboard via any PATA IDE interface to replace an HDD. Ideal for applications where reliability, speed, low power consumption and zero noise are paramount. This product offers designers an easy solution to integrate SSD into PC-based systems. If you are interested in quantities of this or similar parts for project or development work, please have a look at our specialist industrial memory site at www.industrial-memory.co.uk. 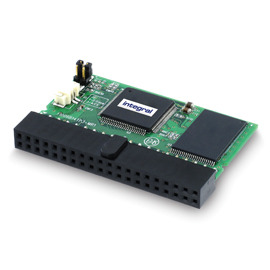 If you're not sure that you need a Internal ATA FLASH IDE MODULE 40V (SSD only) why not check your machine on our online memory configurator which shows the right memory for over 100,000 computers, printers, cameras, routers, phones and tablets?